DOWEX Ion Exchange Resins by DOW Water & Process Solutions | Applied Membranes Inc.
DOW Ion exchange (IX) resins are polymers that are capable of exchanging ions with ions in a solution that is passed through them. DOW's world-class IX resins serve applications as diverse as industrial water softening, pharmaceutical formulations, sweetener purification, mining and more. DOW's IX resins come in a variety of chemical compositions, polymer structures, and particle sizes to meet current and developing industry needs and requirements. Applied Membranes, Inc. carries a variety of DOWEX Ion Exchange Resins and has experience utilizing them in standard and custom water treatment solutions. Buildings & Institutions: DOWEX MARATHON C (Na form) resin is perfect for institutional applications and features uniform beads that exhibit faster kinetics than conventionally sized resins and helps improve regeneration efficiency and higher operating capacity. Food and Beverage: DOWEX Ion Exchange Resins help manage natural food and beverage variability to ensure a more dependable set of characteristics such as taste, color and texture. Industrial Water Treatment: Ion exchange (IX) was the first technology employed to fully demineralize water and we haven’t stopped there. 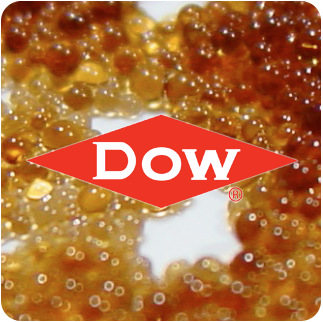 DOW IX ion exchange resins have been invaluable in the softening of water and so much more. Residential: For years, DOWEX IX technology has provided homeowners with soft water for laundry and dish washing that also prevents scale buildup in pipes and faucets.